Modern Woburn dentistry at its finest. Unlike conventional dental drills, dental lasers from Biolase do not produce heat, pressure, or uncomfortable vibrations. Instead, through the process of hydrokinetic technology; laser dentistry, the emitted laser is combined with a gentle spray of atomized water to perform most dental procedures. In addition to altering the hard and soft tissues, the laser also effectively sterilizes infected tissues and eliminates bacteria. 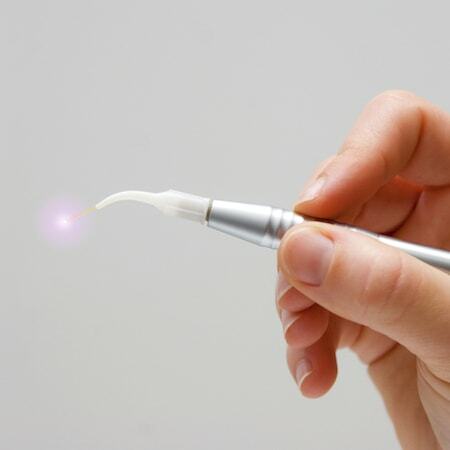 Laser dentistry in Woburn is so gentle that most patients can have their treatment completed without local anesthetics. That means, no numb lips and tongues as you move on with the rest of your day following your dental visit. The laser is finely focused, so as not to affect the surrounding tissues. During surgical and periodontal procedures, laser dentistry can be used to encourage the clotting of the blood at the surgical site. This shortens the healing time and reduces the degree of swelling. The dentists, assistants, and hygienists are all very personable and professional and truly care about me as a patient, my well-being, results, and comfort during all procedures. What Can Laser Dentistry Do for You? From early detection to periodontics. Periodontal pockets, overgrown gum tissue, and periodontal infections can all be treated with laser dentistry. As an alternative to traditional gum surgery and stitches, the dental laser can target problem areas and bring them under control with ease. Dental lasers are also useful for reshaping your gums to lengthen the appearance of teeth and improve the look of a “gummy” smile.